Learn more about my research experience including my PhD dissertation -- a study of phylogeography and species limits in Madagascar's tenrecs. My PhD research focused on phylogeography and species delimitation in Madagascar's tenrecs. A tenrec is any species in the mammal family Tenrecidae. Most tenrecs are only found on the island-country of Madagascar -- you can learn more about them below. Phylogeography is a subset of evolutionary biology. It is the study of the geographic distributions of organisms and how this relates to phylogenetic patterns. This field is helpful in understanding the processes that drive speciation and diversification of living things. Species delimitation is the discovery or delineation of new species, often by studying the genetics and biogeography of existing, recognized species. It is critical for a host of biological inquiry, as species are the fundamental units of ecology, systematics, and conservation biology. Are you a student applying for the NSF Graduate Research Fellowship this year? You can view my successful 2014 materials below. Why Study evolution in madagascar? Only includes native species. SM Goodman & JP Benstead. 2005. Oryx 39:73. Madagascar is a natural model system for studying evolution and diversification. It is located about 400 km off Africa's southeastern coast, and is sometimes called the "8th continent" due to its long history of isolation and its unique biota. Madagascar is a top biodiversity hotspot with remarkable levels of both species richness and endemism, including 100% endemism of its 105 terrestrial mammal species (Goodman & Bernstead, 2005). Despite its apparent proximity to Africa, only four lineages of mammals were able to colonize the island: tenrecs, carnivorans, lemurs, and nesomyine rodents. Evidence suggests that each of these native groups radiated from a single common ancestor between 18-65 MYA (Poux et al., 2008). Scientists are not yet sure what cause the in situ diversification of Madagascar’s biota, but they have several hypotheses related to climate (Pearson & Raxworthy, 2009), rivers (Wilmé et al., 2006), and mountains (Wollenberg et al., 2008). Tenrecs are small- to medium-sized placental mammals in the family Tenrecidae. Today 32 living species are recognized, all of which are endemic to the island continent of Madagascar. All tenrecs are believed to have evolved from a single species that colonized the island from Africa between 35 and 50 million years ago. Since then, tenrecs have undergone an incredible radiation and now exhibit enormous ecological and phenotypic diversity. They include semiaquatic, semifossorial, and scansorial ecomorphologies; heterothermic as well as homeothermic physiologies; short, velvety pelage to stout, barbed, detachable spines; and body sizes spanning three orders of magnitude (2-2000 grams; Goodman, 2003). The tenrecs have also undergone spectacular convergent evolution with moles, shrews, otters, and hedgehogs, as reflected by their common names (e.g. mole tenrec, shrew tenrec, etc. ), but are in fact more closely related to elephants and aardvarks than their namesakes. Tenrecidae includes three subfamilies (Geogalinae, Tenrecinae, Oryzorictinae), 8 extant genera (Geogale, Limnogale, Tenrec, Echinops, Setifer, Hemicentetes, Oryzorictes, Microgale), and 32 recognized living species. The first step of my research was to develop a comprehensive phylogeny of the family Tenrecidae based on a suite of 10 Sanger-generated mitochondrial and nuclear loci. With this dataset I was able to infer divergence timing for this family. This research was published in the journal Systematic Biology (Everson et al. 2016) and received the Society of Systematic Biologists' Publisher's Award for best student publication of 2016. The next step is to generate a nuclear genomic dataset via Next-Generation Sequencing using Ultraconserved Elements as molecular markers. This methodology will be applied to several taxa (chosen from preliminary phylogeographic analyses) and used to assess phylogeographic patterns and species limits. This research will unveil several new species and help us better understand the drivers of diversification throughout Madagascar and in montane humid forests worldwide. My senior honors thesis as an undergraduate was a study of the evolution and geographical distribution of the Woolly Mouse Opossum (Marmosa demerarae), a small South American marsupial. Working at the University of São Paulo (USP) with Dr. Alexandre Percequillo, I hypothesized that the major Amazonian Rivers drive speciation by preventing populations on opposite banks from interbreeding with one another. I used preserved skulls and skins from the USP museum to record measurements on individuals from both sides of a large Amazonian river, then showed statistically that these populations are morphologically distinct. I also extracted DNA from the same individuals and sequenced the mitochondrial cytochrome-b gene. These sequences showed molecular divergence between the populations on each river margin; my original hypothesis was therefore supported by both the morphological and molecular datasets. This study system may be an example of incipient allopatric speciation. I presented my research at the 2012 Denman Undergraduate Research Forum and published my complete thesis with The Ohio State University. 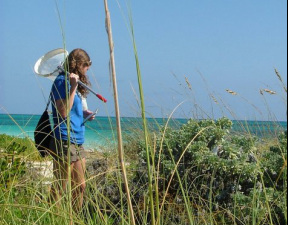 In 2011 I conducted an independent research project on the reproductive biology of Bay Lavender, a common dune plant on San Salvador Island in the Bahamas (with my wonderful advisor Carol Landry). I was interested in whether this species was capable of self-pollination, if the behavior occurred naturally, and whether it affected the fitness of the resulting offspring. I performed hand-pollinations and analyzed all reproductive stages, showing that Bay Lavender is indeed capable of self-pollination and that this behavior has no significant effect on the fitness of F1 progeny. I also found that pollinating insects spent much time on the same plant, and even on a single inflorescence, demonstrating that self-pollination occurs naturally. I presented my research at the 2012 Denman Undergraduate Research Forum and at the Symposium on the Natural History of the Bahamas in 2013. San Salvador Island is prone to disturbance by hurricanes and rising sea levels, and both plants and pollinators there are known to undergo periodic local extinction, so my research generated important information for future conservation efforts. I concluded that Bay Lavender serves as a key foraging plant for at least 12 insect species from three orders and that self-compatibility makes Bay Lavender a good pioneer species, with the ability to easily colonize new dunes with just one or a few individuals. However, population health must be monitored closely, because the accumulation of deleterious alleles could make these selfing populations more susceptible to collapse. During my first two years at Ohio State (2009-2010) I worked as a Research Assistant in Dr. Kristin Mercer's Plant Evolutionary Ecology Lab, where I participated in studies of gene flow and hybridization between wild and domesticated sunflowers. We hypothesized that accidental backcrossing from transgenic crops on wild populations could result in the creation of “superweeds,” which would outcompete both wild and crop varieties. Results from this study demonstrated that although hybrid wild-crop sunflowers had reduced fecundity, they were much more likely to survive to reproduction and outcompete parent types in high-stress environments. I also worked as a Research Assistant in Dr. James Bauer's Aquatic Biogeochemistry Lab during my last two years of college (2011-2012). There I learned carbon dating and nutrient analysis methods and used them to study organic and inorganic inputs to aquatic systems and their interplay with basal food chain organisms. This lab found, unexpectedly, that nearly 60% of the zooplankton biomass in the Hudson River is highly-aged soil material, dating to thousands and even millions of years ago. This suggests that primary production within the watershed is not necessarily cornerstone to modern aquatic community stability, as aquatic consumers can use previously sequestered, relatively ancient sources of organic matter. Finally, I spent my summers as an undergraduate working as a Laboratory Assistant at OSU's F.T. Stone Laboratory and Biological Field Station on Gibraltar Island in Lake Erie. There I assisted visiting professors and researchers and led public discussions about research on the Great Lakes.